High school basketball rules have many points in their regulations that turn the game into an educational experience as well as an athletic competition. 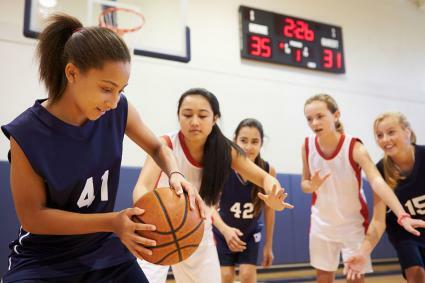 High school basketball's emphasis is on learning to work together as a team, but it can also be a teen's chance to get noticed by college and professional scouts. The National Federation of State High School Associations (NFHS) is the national organization that oversees high school sports. Their rules, which are updated annually, set the standard for competitive high school basketball and are available on Amazon in ebook format for about $7. High school basketball rules differ from college and NBA play in many ways. In all levels of basketball for boys over age 12 or men, the standard ball size is 29.5 inches in circumference. Women and girls over age 12 at all levels use a ball that is 28.5 inches in circumference. It is acceptable for high school teams to play four eight-minute quarters as one game. Men's college basketball plays two twenty-minute halves while women's college basketball plays four ten-minute periods. The NBA plays four twelve-minute periods. A timeout is a break in the game that stops the clock for a brief period so teams can substitute players, strategize, or give players a quick rest. In high school play, there are three 60-second and two 30-second timeouts per game. These may be requested by the player or head coach and if both teams are ready, the timeout may be reduced in length. If more timeouts are requested in high school, this will earn the team a technical foul. In college play, three 30-second and one 60-second timeouts are allowed if played in front of the media, or four 75 seconds and two 30-second timeouts if the game is not being covered by the media. Instead of a technical foul for additional timeout requests, men's college basketball allows two shots at the point of interruption, and women's college ball allows for two shots and loss of the ball to occur. NBA teams get seven 60-second timeouts per game and one 20-second timeout per half. A defensive player establishes a legal guarding position when he has both feet on the ground and is facing an offensive player. Legal position may be established anywhere on the court in high school. In college and the NBA, the exception is that a secondary defender can't get an initial legal-guarding position in a restricted area of four feet under the basket in an attempt to draw an offensive foul. A technical foul is called when a player, team, or coach commits an act of unsportsmanlike conduct or a foul that does not involve physical contact between players on the court. During high school basketball, two free throws are allowed and possession is awarded to the offended team after a technical foul is called. Play resumes by a throw-in opposite the table. In college ball, two free throws are allowed and the game resumes at the point of interruption. For women's college ball, a technical foul also results in loss of the ball. In all levels, a person with two technical fouls in one game for unsportsmanlike conduct is ejected from the game. In the NBA players must pay a fine for every technical foul. During a high school game, a shooter is airborne if he or she is in the air after the release of an attempted shot or tap. Men's college ball has no rule and women's college ball is the same as in high school. To be closely guarded, a defender must be within 6 feet of the offensive player. 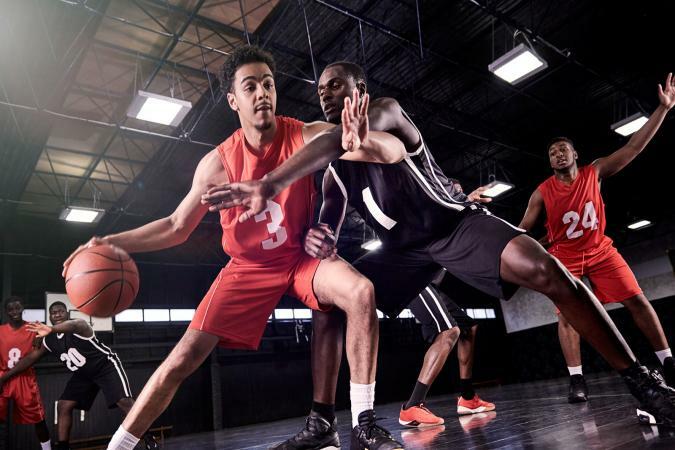 During a high school game, closely guarding is called if a player is holding or dribbling at the frontcourt at the six foot distance. College ball has the same rule, but it's only for holding, not dribbling. Post play describes the act of an offensive player handling the ball with her back to the basket. High school players cannot use an extended arm bar during post play. College players are allowed to use their forearm. A jump ball is when an official throws the ball up in the air to start or restart play and two opposing players then attempt to gain control of the ball. Any re-jump in high school has to be by the players who were involved before establishing team control. In college, any two players can do the re-jump. High school players and college men are allowed to keep one foot in the lane if the other foot is in the air to avoid a three-second violation. In women's college ball, both feet must be on the court outside the free-throw lane. Starting from the backcourt, with time starting when a player has control of the ball, the team has ten seconds to get over the mid-court line. In college ball, the count starts on the legal touch of a thrown-in ball. During a high school game, players are disqualified after their fifth foul or second technical foul. The head coach is disqualified after the third direct or indirect foul, or the second direct technical foul. During men's college ball, disqualification happens after the fifth personal foul, including direct and intentional fouls. In high school basketball, coaches can be issued administrative warnings for a variety of minor infractions including entering the court without permission, disrespectfully addressing an official, standing on the team bench, or violating the coach-box rule. In college, the only administrative warning given is to the head coach for being outside the coach-box or specific delay-of-game tactics. Players are issued standard shorts with a jersey depicting their team colors that must be worn during all competitive games. Home game jerseys must be white and dark colors clearly distinct from white are used for away games. The torso of the jersey must be a solid color, not a pattern. The number on the jersey must be visible on the front and back and the color must be the same. It should be at least 4 inches high on the front and 6 inches high on the back. Jersey umbers can range from 00 to 15, 20 to 25, 30 to 35, 40 to 45, and 50 to 55. Each jersey can feature an American flag that is not more than 2 inches by 3 inches and does not cover the player's number. All undershirts must have the same length of sleeves. Headgear for medical or religious reasons may be allowed with documented evidence that is shared with officials at each game. Players are not allowed to remove their jersey or pants within the visual field of the playing area. Good sportsmanship and respect for the rules are taken seriously at all levels of basketball. Addressing Officials - Only the head coach of a team is supposed to communicate with game officials in high school ball. Fighting- At a high school game, fighting results in immediate ejection from the game. At the college level, ejection for coaches and team players starts with a one game suspension, followed by a season suspension for repeat behavior. Medical - A player knocked unconscious during a high school basketball game may not return to the game without clearance from a physician. There is no such mandatory rule for college basketball. When governing organizations review their regulations and any issues that occurred, they often find ways to clarify rules, update them, or change them altogether. The length of an extra period in high school is four minutes while in college and the NBA its five minutes. Basketball officials must be on the court fifteen 15 minutes before the start of the game. In college men's basketball, an official must be on the floor 20 minutes before the start of the game. There are no rules regarding the use of a Shot Clock, Stop Clock, and Substitutions with less than one minute or less remaining in the second half or overtime. The size of the coaching box is now a maximum of 28 feet where in college it has been extended to 38 feet. During a high school basketball game, videotaping is legal for coaching bench personnel. In college ball games, videotaping is only illegal at courtside. During a high school basketball game, the use of a replay monitor is forbidden. This is not true for a college game. The first step to becoming a great high school basketball player is learning the rules. Each player is responsible for understanding the game and working within the rules help their team win.